Sloan Flushmate Pressure-Assist Tanks are available in many different configurations to fit Flushmate-Equipped Toilets made by various porcelain manufacturers. 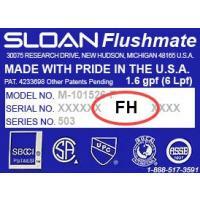 Flushmate systems will have a series of numbers stamped on the label on top of the plastic tank. Once you have those numbers you are well on your way to finding the correct parts for your toilet. Below you will find a list of Serial Numbers for the “FHx” series which will consist of a Date Code (mmddyy), your Series Code (FHx), and a Manufacturing Code (xxxx). Click on the category below that matches your Series Code to view Repair Parts and Replacement Tanks for your toilet.